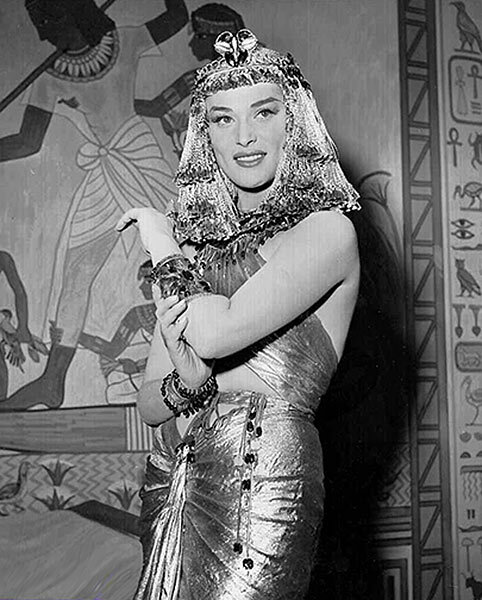 Bella Darvi starred in THE EGYPTIAN as Nefer. This was her only second film. She starred in 3 films for 20th Century Fox before her career in Hollywood was effectively over. It is well known that Darvi was Darryl F. Zanuck's mistress, brought from Europe to Los Angeles because she slept with the studio boss. When Zanuck's wife realized this she sent Darvi packing and back to Europe. "Marlon Brando was originally scheduled to appear opposite Darvi in the Technicolor epic THE EGYPTIAN (1954). During the script read-through before filming began, the pair disliked each other at first sight. Bella, cast as the courtesan Nefer, was also jeered by more experienced star Jean Simmons who laughed with other cast members that Darvi was "an actress who 'nefer' was." Just as filming was to start, Brando refused to make the film, his agent telling studio head Darryl F. Zanuck: "He doesn't like the director, he doesn't like the role. And he can't stand Bella Darvi!" Edmund Purdom was cast in the role." It's pretty obvious that Darvi was miscast as Nefer. I won't go into details why I think so but she only got the role because she was a mistress not an actress. Once back in Europe she continued acting from time to time but her gambling debts were too big for what little she got paid as an actress (or anything else) and she kept on asking Zanuck to help her financially. He did help her up until the early 1970s. After he refused to help her financially, Bella killed herself by turning on the gas stove in her apartment. She was only 42.